I have a brilliant idea. 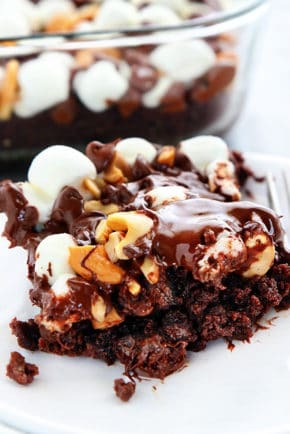 Drop everything and go make these. Seriously. 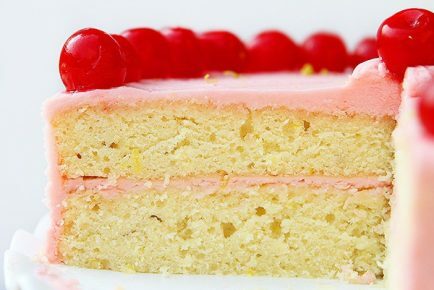 They are simple to do but produce a surprisingly delicious result! I am hard pressed to get the kids a delightful hot breakfast in the summer, but I think that should change. 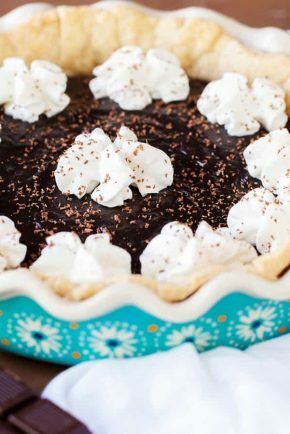 The nice thing about this uncomplicated recipe is that I can change it up! Use plain biscuits, use a different fruit, make my own glazes… and none of those changes add any more prep time! But for me, this was the winning combination. 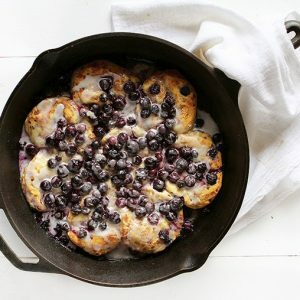 Cinnamon roll (hello perfect breakfast food) covered in lemon infused blueberries that playfully burst in a flavor explosion with each bite. Not to mention the sweet glaze dripping off of every fork full. Heat oven to 400°F. Prepare a 12-inch cast-iron skillet with butter. 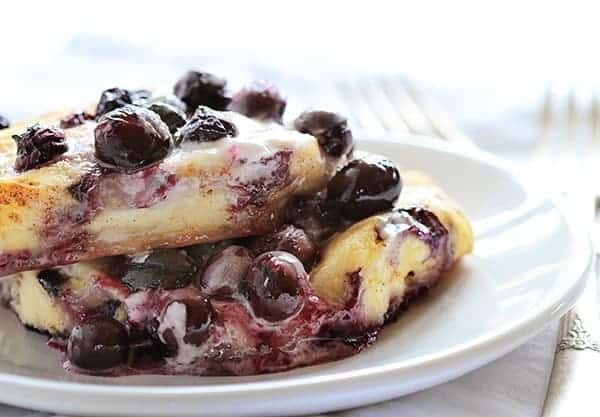 In small bowl, mix blueberries, sugar, lemon juice and cornstarch and then pour on top of rolls. Bake 15 to 18 minutes or until golden brown. Remove lid from the icing container and microwave for about 10 seconds, until it is pourable. Right out of the oven, drizzle icing over rolls. Recipe just barely adapted from Just a Pinch. Stir together butter, 3 teaspoons lemon juice and powdered sugar in small bowl. 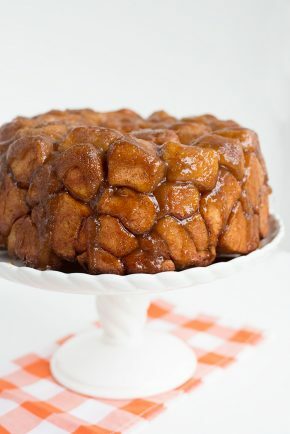 Stir in more lemon juice if needed, you want the glaze to be smooth and can be drizzled easily. Next on my list of things to do? Buy another skillet so I can make more of these at once! With a family of seven, these were gone in 3 minutes flat! Nest next on my list? Try these with cinnamon rolls made from scratch! Next, next next on my list? Finding that darn list. I want to marry you for these. 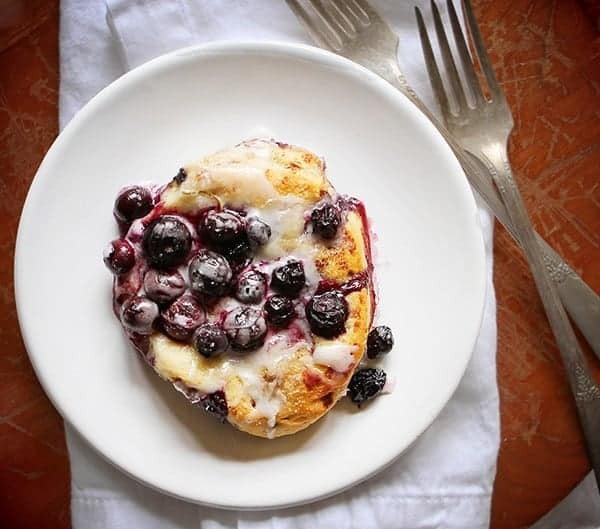 Is there anything better than a cinnamon roll with blueberries, lemons and ALL THE icing? No, there is not. 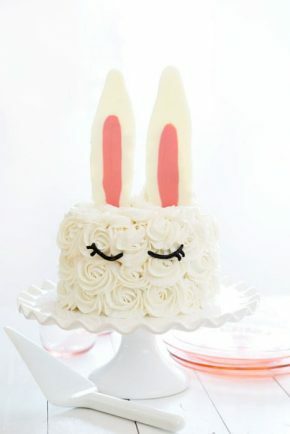 Pinning and drooling! 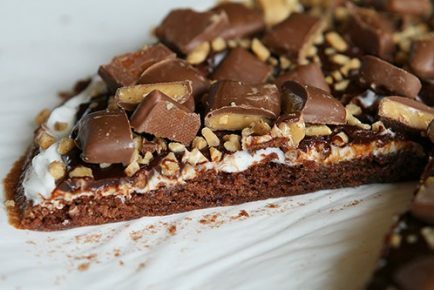 can you come over and make these for me….they look sooooooooooooooooooooooo good! They are so easy… you should make some!!! Wow a winning combination for sure! These look fabulous! ahhhhh, love love love these!! 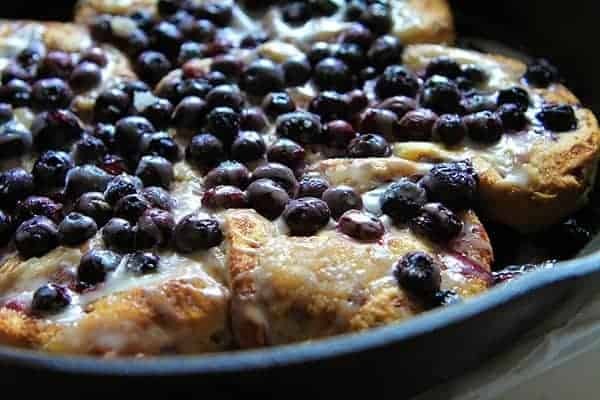 cinnamon rolls are my favorite breakfast, ever, and they can only get better with blueberries and lemon!! These just came out of the oven…very good! I added lemon juice to the frosting before pouring it on top. So good! What should we use if we don’t have a cast iron. Skillet? Let me try this again using correct grammar lol. 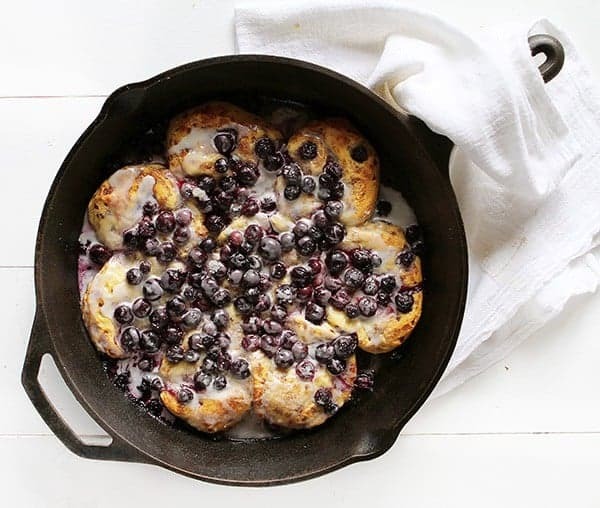 What should we use if we don’t have a cast iron skillet? What is the significance of the cast iron skillet? You can’t bake a regular skillet in the oven with the handle on it.